The mayor of New Zealand's second-largest city, Christchurch, has declared a state of emergency in the aftermath of a 6.3-magnitude earthquake that rocked the "garden city" shortly before 1 p.m. local time on Tuesday. Prime Minister John Key, who was raised in Christchurch, said that at least 65 people are known to have died in what "may well be New Zealand's darkest day." 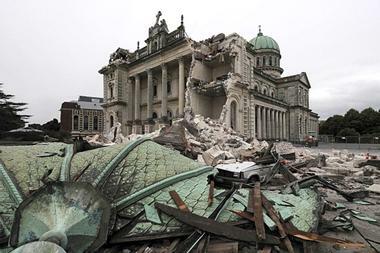 The New Zealand earthquake is already the deadliest to strike the country in the past 80 years and the death toll is expected to rise. It's the second major earthquake to hit Christchurch in five months, the first causing an estimated $3 billion in damages from multiple aftershock, but no deaths. This time, rescue crews are mobilizing from around the country to assist in what will be a massive rescue and rebuilding effort. For now, though, authorities in the country's capital, Wellington, are scrambling just to get information with the phone lines down and airports closed. "There are people fighting for their lives at the moment, but there are also people fighting for them," Christchurch Mayor Bob Parker told reporters as the first of more than 20 aftershocks to be recorded on the day began to be felt. "We're preparing ourselves for what I think will be a really sad, bleak day for our city but be reassured everybody is doing what they can." Mr. Parker has asked some 350 military personnel to help in the evacuation of the city's downtown area.